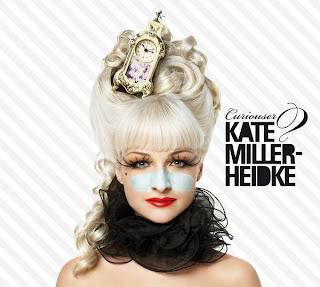 Australian singer-songwriter Kate Miller-Heidke is set to release her US debut record, Curiouser, on March 16. For those of us who like to check out live shows, she's also hitting the road. She'll show New York some love when she plays Joe's Pub on March 15. If you miss her then, you'll still have the opportunity to see her as she'll be back in town with Ben Folds. They will be playing Town Hall on April 12 & 13. Check out the MP3 "Politics In Space" below as well as the video for "Caught In The Crowd." “We” includes Kate’s partner in life and music, husband/guitarist/collaborator Keir Nuttall. Recording with Los Angeles producer Mickey Petralia (Beck, Peaches, eels, Dandy Warhols), who had the right mix of humor, enthusiasm and weird old electronic stuff to offer the new tunes, Miller-Heidke, Nuttall, bassist Ben McCarthy and drummer Steve Pope spent two months crafting Curiouser. With his strict 4pm to 4am shifts (with no days off), Petralia's studio wizardry turned out to be the perfect galvanising force for Miller-Heidke’s and and Nuttall’s carefully detailed home demos. “To me,” she said, “it sounds like a modern album, a forward-looking album.” To everyone else, however, it sounds like one of the best Australian records in recent memory – a set embraced by an enthusiastic audience and one lauded with critical acclaim. MP3 Grab: "Politics In Space"